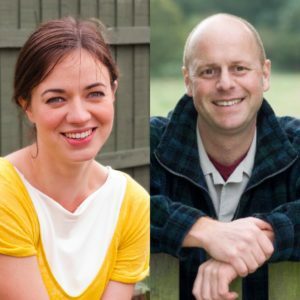 It’s a Gardener’s World for us as we’re joined by some famous names from TV gardening with popular garden designer Joe Swift and Frances Tophill confirmed as speakers for 2019. Joe Swift has presented on Gardeners’ World since the late 1990’s and has fronted numerous TV shows including Open Gardens, Small Town Gardens, Garden Makers and Garden Invaders and appeared on Celebrity Masterchef. He writes regularly for The Times and has written 3 books – ‘The Plant Room’, and ‘Joe’s Urban Garden Handbook’, and ‘Joe’s Allotment’. Joe has designed many gardens for TV, including one for Comic Relief, many for Gardeners’ World & all of the Alan Titchmarsh’s ‘How to be a Gardener 2’ series. Joe is the President of the National Gardens Scheme, and patron to many gardening charities including The Horniman Museum and The Harington Scheme. He also plays bass guitar, is a life-long Arsenal fan and plays football and golf whenever he gets the chance! Frances Tophill is part of the presenting team for Gardeners’ World and ITV’s Love Your Garden, travelling all over the country to create surprise transformations to the outdoor spaces of some very deserving people. She works on a number of community gardening projects in the South West and is also helping the redevelopment of some coastal gardens that were damaged by the 2014 storms. Hailing from Deal in Kent, Frances now lives in Exeter having graduated with a BSc in Horticulture with Plantmanship at the Royal Botanic Garden Edinburgh. Joe Swift is here on Friday 3rd May and Frances joins us on Saturday 4th May. Talks are free to visitors.